Irwin Werbowsky with his Gio Ponti bowl at The Exchange. It’s the stuff of Antiques Roadshow fans’ dreams: A guy walks into a yard sale, an interesting ceramic bowl catches his eye, and he buys it for a dollar—only to discover that its twin sold at Christie’s auction house in New York for $30,000 in 2011. The lucky guy with the good eye is Irwin Werbowsky, who consigns and volunteers at The Exchange (formerly the Woman’s Exchange), the nonprofit consignment shop in downtown Sarasota that raises hundreds of thousands of dollars each year for local arts organizations and art student scholarships. And the bowl is a glazed ceramic bowl designed around 1927 by Italian modernist architect and furniture and industrial designer Gio Ponti. It's named “Leonia.” According to the Christie’s website, it measures five inches high by 10-and-three-quarters in diameter. It had been estimated to sell for between $8,000 and $12,000, but went for $30,000 at Christie’s Important 20th Century Decorative Art & Design sale. 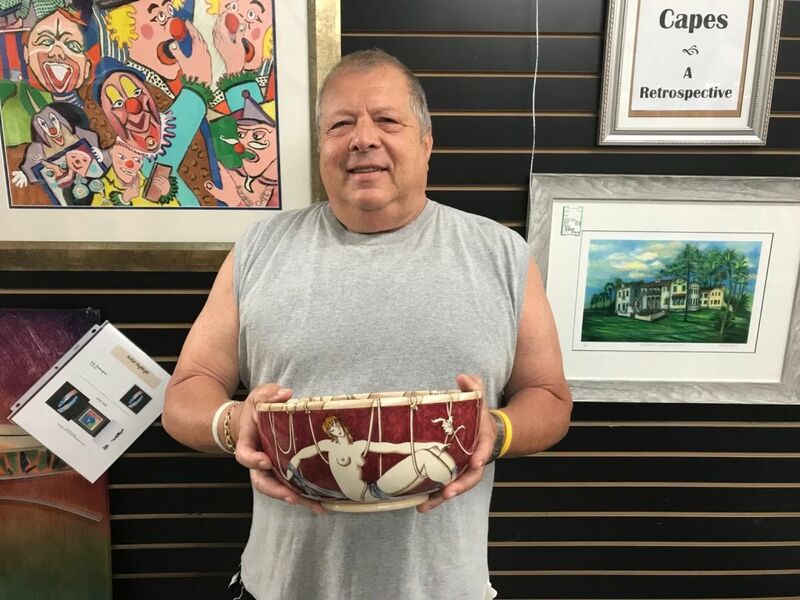 Werbowsky took the bowl into The Exchange to consign it, and pricer Kim Connor researched it, only to discover the 2011 sale. The sale price that The Exchange will market “Leonia” for is yet to be determined—but we’re sure Werbowsky’s dollar was well spent.